To present the technique and the results of laparoscopic Roux-en-Y gastric bypass (LRYGBP) using 3 ports technique for the treatment of the morbid obesity. This is a retrospective review of the medical records for the patients who have underwent LRYGBP using 3 ports technique and were operated by the first author in Riyadh Military Hospital, Riyadh, Saudi Arabia. In the period from April 2004 to December 2008, 37 patients, out of 343 patient have LRYGBP, have underwent LRYGBP using 3 ports technique. They were 26 females and 11 males. The age was 28 years ( 15-52 years). The body mas index was 42.4 kg/m2 ( 35 – 54 kg/m2).The average time of the operation was 70 minutes. The hospital stay was 1-3 days. There was one patient who had immediate postoperative hematemesis which was stopped spontaneously. One patient needs abdominal drain for 24 hours.There was no other major complications and no mortality. All of these patients were primary LRYGBPwithout history of previousabdominal surgeries. 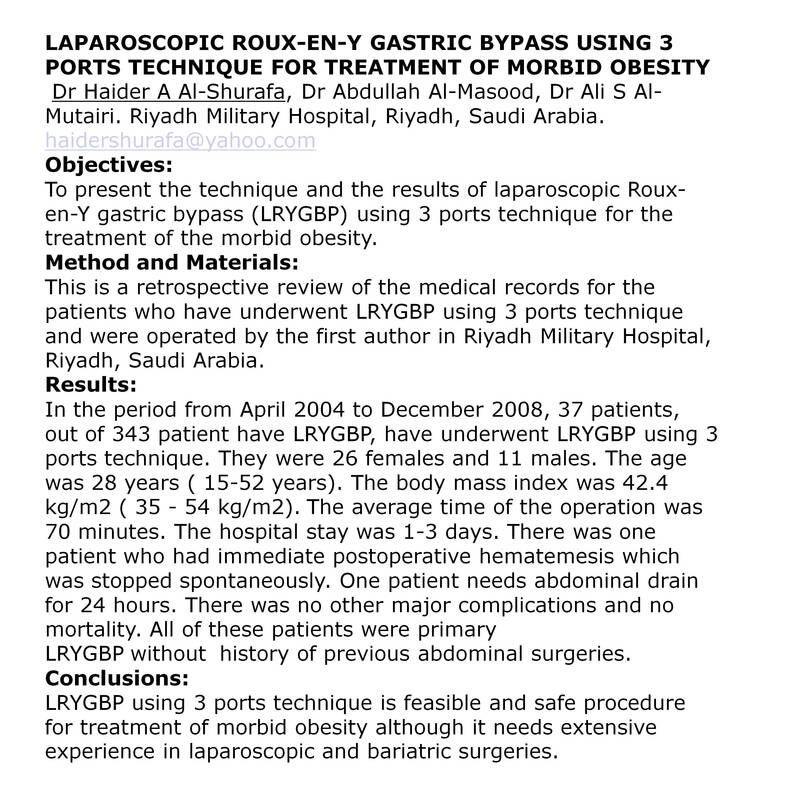 LRYGBP using 3 ports technique is feasible and safe procedure for treatment of morbid obesity although it needs extensive experience in laparoscopic and bariatric surgeries.